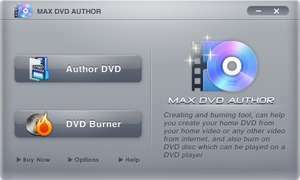 Max DVD Author is a DVD creating and burning tool, can help you create your home DVD from your home video or any other video from internet, and also burn on DVD disc which can be played on a DVD player. It will create interactive menus for you automaticly. Support of input MPEG-1/2, Windows AVI (*.avi), Windows Media Video (*. Max DVD Author 3.2 is a shareware program and can be used as a demo to try the software until the free trial period has ended. A full version of the program is available after the trial period ends. For security reasons, you should also check out the Max DVD Author download at LO4D.com which includes virus and malware tests. Additional screenshots of this application download may be available, too.